"Jack was gracious enough to take time to help me rewrite..."
"Bon Voyage Uncle Jack! This is your final and Forever..."
"May the God of all comfort strengthen the entire family..."
"RIP Jack, a great friend and co-worker. You were my dad's..."
SCARBOROUGH - John "Jack" Horton Smith, 92, died at Piper Shores in Scarborough on Sept. 9 after a brief illness. He was born April 20, 1926 in Clifton, N.J., the son of Vera and Casper Smith. After graduating from high school in Passaic, N.J., Jack attended Dartmouth College where he played football and lacrosse. Upon graduation he received a Bachelor of Arts degree and was commissioned an Ensign in the U.S. Navy. He then served as Gunnery Officer on the USS Endicott (DMS-35) in the Pacific during World War II. After discharge, he attended the University of New Hampshire (UNH), receiving a Bachelor of Science in Mechanical Engineering. He was a ramjet and rocket engine engineer at Curtis-Wright, Reaction Motors, and Thiokol Chemical Corporation, developing the power plants for the Republic XF-103, Lockheed X-7, and North American X-15 aircraft. 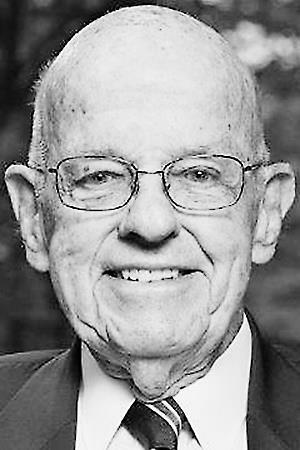 After moving to Cape Elizabeth in 1961, Jack was Chief Engineer at Gulf and Western in South Portland, and later was a co-founder of Portland Valve, Inc., which designed and manufactured ball valves and components for nuclear submarines. Jack was a charter member of the American Rocket Society, a member of the American Society of Mechanical Engineers, and the Society of Automotive Engineers. An avid sportsman, he was a member of the Football Officials Associations in both New Jersey and Maine, and the NCAA Lacrosse Officials Association. In addition, he was a member of the Tin Can Sailors Association, the Navy League of the United States, Hiram Lodge #180 in South Portland, and the Kora Shrine Temple in Lewiston. Jack was an active alumnus of the University of New Hampshire, where he was a member of the Alumni Association, the President's Council, the Milne Society, and the Heritage Society. He was a founder and president of the UNH College of Engineering Alumni Society. Jack has received the College of Engineering Distinguished Alumni Award, the Alumni Association Meritorious Service Award, the Hubbard Philanthropic Award and, most recently, was elected into the UNH Athletics Hall of Fame. He was predeceased by his wife, the former Joan Smithyman, in 1997, and his second love, Barbara Bridle Peyser, in 2012. He is survived by a son, David Smith and wife, Sherry, of Clinton, Connecticut; granddaughter, Jill Gallagher and husband William, of Chatham, New Jersey; grandsons, Michael Smith and husband Ying-tsung Lu, of Washington, D.C.; Eric Goodwin and wife Erica, of Chicago, Illinois; and Matthew Goodwin and wife Jessica, of Clinton, Connecticut; eight great-grandchildren; as well as many dear friends and extended family. A special thank you to the nurses and aides of both Piper Shores Health Center and Compassus Hospice for their love, concern, and care given to Jack. Visitation will be held Tuesday, Sept. 18 from 4-7 p.m., at Hobbs Funeral Home, 230 Cottage Road, South Portland. A funeral service will be held at 2 p.m., Wednesday, Sept. 19 at the First Congregational Church, 167 Black Point Road, Scarborough. Interment immediately following at Riverside Cemetery in Cape Elizabeth.